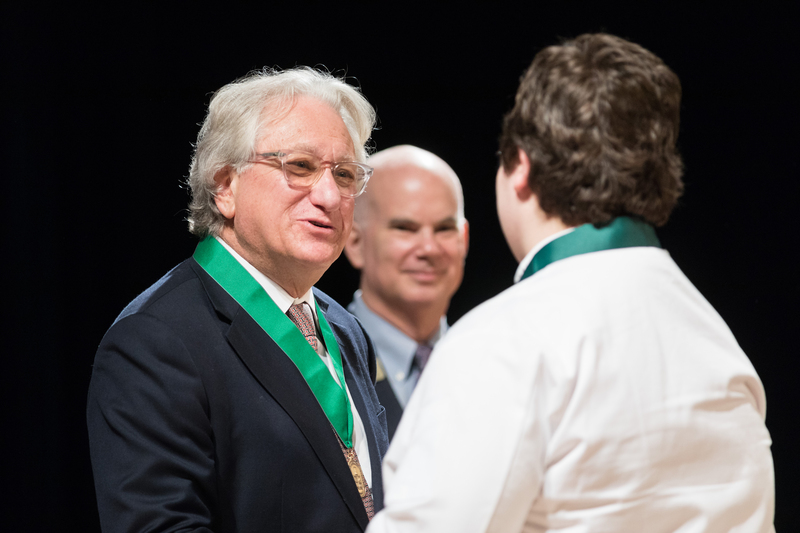 Hyde Park, NY – Laurence Geller, chairman of the luxury hotel investment and management firm Geller Capital, delivered the graduation address at the New York campus of The Culinary Institute of America on March 23. His company has been behind the acquisition and remodel of the Marriott Georgetown in Washington, DC; acquisition and strategic re-launch of the Waldorf Astoria Chicago; and construction and opening of the Chicago Conrad Hilton. Before launching his current company in 2014, Mr. Geller was president and CEO of Strategic Hotel Capital, a company he founded in 1997 that was purchased by Chinese real estate investor Anbang for $6 billion. His career in the hospitality business also includes senior leadership positions at Hyatt Development Corporation, Holiday Inn, and Grand Metropolitan Hotels. A native of the United Kingdom, Mr. Geller was awarded the honor of Commander of the Order of the British Empire by Queen Elizabeth in 2011 for his “charitable and humanitarian work internationally.” He has also been appointed chancellor of his alma mater, the University of West London. In addition to his business acumen, Mr. Geller is a dedicated philanthropist, supporting institutions and organizations in both the U.K. and United States. He is chairman of The Churchill Society and a member of the CIA’s Society of Fellows. The entire CIA commencement ceremony, including Laurence Geller’s address to recipients of associate degrees in baking & pastry arts and culinary arts, can be seen online.